500g pork shoulder cut into bite size chunks. This dish is so lovely and rich. 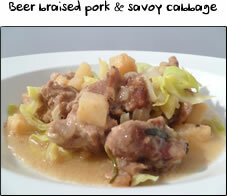 By slowly cooking the pork in the cider, the pork becomes melt in your mouth tender. 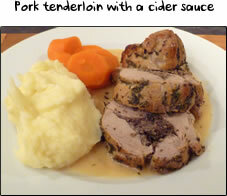 The cider then provides the basis for a lovely rich sauce. Add in some iron rich spinach and creamy mash and you have the perfect dish for a cold Sunday afternoon. This is a two part recipe. In part one we prepare the pork and start the cooking. In part two we make the mash and the sauce, then finish everything off. Pan to boil the potatoes. Before you start, preheat your oven to 180c. Have the pork chopped and ready on your work surface. Put your large pan on a high heat and click here! Before you start, put a pan of salted boiling water on the hob. Have the potatoes peeled and chopped. 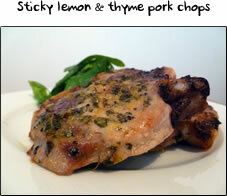 Take the pork out of the oven and click here! Preheat your oven to 180c and put your large pan on a high heat. Add a knob of butter and a tablespoon of oil to the pan. Leave that to melt whilst you go and season the pork with salt & pepper. Add the pork into your mixing bowl with the flour and toss together. Take the bowl over to the hob, and dusting the pork lightly to remove any excess flour, take half of the pork and put it in the pan. Move the pork around the pan to get a light colour on it. Once they've slightly coloured, remove them to a plate and repeat the process with the other half of the pork. If the pan becomes dry, add in another dash of oil. Once the second batch has coloured slightly, add the first lot back in. Then add in your thyme and the bottle of cider. Stir this to check that nothing's sticking then go and give your hands a good wash! Turn the heat off now and put a lid on. If your dish can't go straight into the oven then transfer to an oven proof dish and cover. Pop the pork in the oven for 40 minutes. 40 minutes later, have a pan of boiling water on the hob for the potatoes, take the pork out of the oven, take the lid off and put it back in the oven for 20 minutes. Put the potatoes on to boil for 15-16 minutes, then drain them and leave them in the pan until the pork's done. Turn your remaining pan on high for the spinach. Add about a teaspoon of oil and when the pan's heated slightly add in the spinach. Keep turning the spinach in the pan and it'll only take about 1.5 minutes to wilt down. Add a small pinch of salt and then turn the heat off and drain the spinach over a colander. 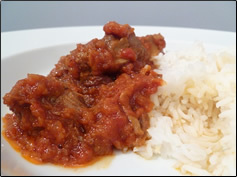 To serve, using a slotted spoon to avoid the liquid, take a nice big spoonful of pork and place it on one side of the plate. 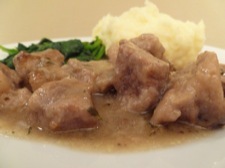 Next place your spinach next to the pork, followed by a nice dollop of mashed potato. 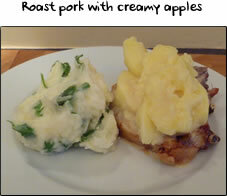 Lastly, generously spoon the sauce over the pork and you're done!